Can’t believe the holdiay season is already here. Where did the time go? Are you giving gift cards this holiday season? Make giving gift cards more personal by making a gift card holder. These gift card holder’s work up quick and they are easy to make. You can personalize the gift card holder for each recipient by using yarn in their favorite colors. After they use the gift card, they can continue to use the gift card holder as a business card or reward card holder. Finish off, leaving a long end for sewing. 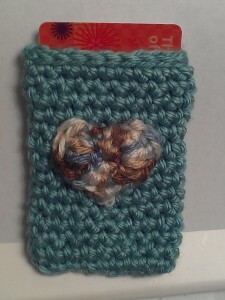 Sew heart to gift card holder with a yarn needle. This entry was posted on Sunday, December 8th, 2013 at 12:00 AM by Laurie Beranek	and is filed under Free Crochet Patterns. You can follow any responses to this entry through the RSS 2.0 feed. You can skip to the end and leave a response. Pinging is currently not allowed. Give Crochet Gifts You Do Not Have to Crochet!